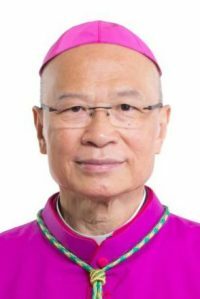 HONG KONG (CNS) — Pope Francis has sent condolences and a blessing to the Hong Kong Diocese following the Jan. 3 death of Bishop Yeung Ming-cheung, 73, of liver failure. The pope also named Cardinal John Tong Hon, retired bishop of Hong Kong, to administer the diocese until a new bishop is appointed by the Vatican, reported ucanews.com. A Jan. 5 letter sent on behalf of Pope Francis conveyed his personal sadness to the clergy, religious and lay faithful there. “United with them in prayerful thanksgiving for Bishop Yeung’s years of priestly and episcopal ministry, His Holiness commends his soul to our heavenly Father’s merciful love,” the letter stated. The letter was sent by Cardinal Pietro Parolin, secretary of state, via Hong Kong representatives at the Vatican. Bishop Yeung’s body will lie in repose in the Cathedral of the Immaculate Conception beginning Jan. 10, when a vigil Mass will be celebrated by Cardinal Joseph Zen. On Jan. 11, a funeral Mass will be concelebrated at the cathedral, presided over by Cardinal Tong. Auxiliary Bishop Joseph Ha Chi-shing will preside over the burial rite at St. Michael’s Catholic Cemetery. Bishop Yeung was born in Shanghai Dec. 1, 1945, and was ordained a priest in Hong Kong in 1978. He served as chairman and CEO of Caritas Hong Kong for more than a decade. Bishop Yeung was ordained as one of the three auxiliary bishops Aug. 30, 2014. In November 2016, Pope Francis named him coadjutor bishop with automatic rights to succeed Cardinal Tong.